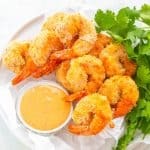 Air Fryer Bang Bang Fried Shrimp is a quick and easy, healthy, low-fat recipe with sweet chili and Sriracha dipping sauce. Season the shrimp with the seasonings. Place the flour, egg whites, and panko bread crumbs in three separate bowls. Create a cooking stations. Dip the shrimp in the flour, then the egg whites, and the panko bread crumbs last. When dipping the shrimp in the egg whites, you do not need to submerge the shrimp. Do a light dab so that most of the flour stays on the shrimp. You want the egg white to adhere to the panko crumbs. Spray the shrimp with cooking spray. Do not spray directly on the shrimp. The panko will go flying. Keep a nice distance. Add the shrimp to the Air Fryer basket. Cook for 4 minutes. Open the basket and flip the shrimp to the other side. Cook for an additional 4 minutes or until crisp. Combine all of the ingredients in a small bowl. Mix thoroughly to combine. Use your judgment for cook time. I like for my shrimp to be extra crispy, so 8-10 minutes works for me.